How to Choose the Blue That’s Right For You! Are you hunting for the best blue and not just any hue will do? Then you’ve come to the right place! 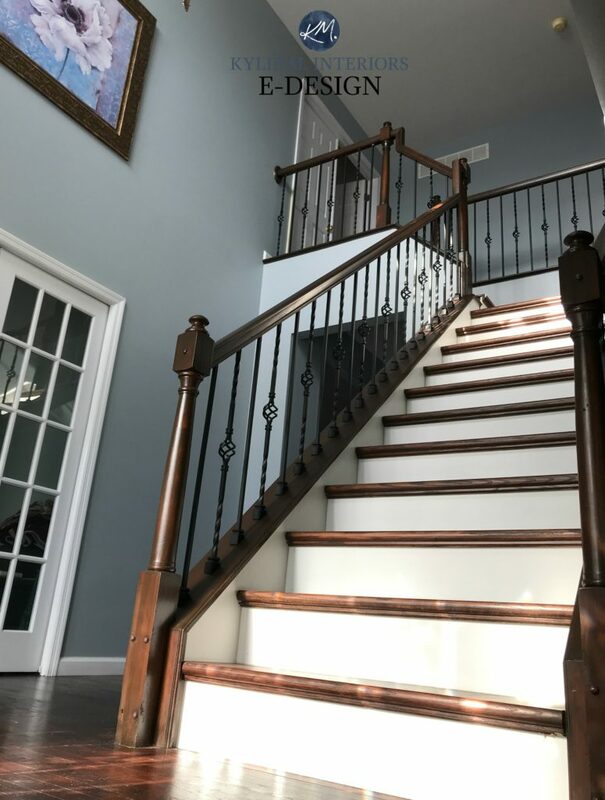 Blue is a popular paint pick for MANY reasons. It’s calming, classic, coastal, country – subtle, striking and sensual, but the one thing it isn’t? Easy to pick. Short of going ‘primary blue’, it can be hard to peg down a true-blue, particularly once you start mixing in gray. A colour like Newburyport Blue is more likely to give a ‘true-blue vibe’ without going right into the primary range. These are blues that lean slightly more toward purple, without committing all the way. These blues often feel a bit cooler than neutral or softer blues. Technically, these are blues with a touch of red in them, and you know how technical I am (wink wink). In our last home (above), it was a toss-up as to whether our guests thought the paint colour was blue, blue-purple or gray! Not I’m not going to say that blue/greens are WARM, but they are definitely a bit softer and more inviting looking than blue-purple colours. Technically, these are blues with a touch of yellow in them. In the above 2 photos of Silver Marlin, things look pretty darned green in spots! However, this is a combination of lighting and exposure, as Silver Marlin is a beautiful blend of blue, green and gray! And why does all of this matter? Because you want to make sure that you pick the type of blue that you like and avoid the ones you don’t. If you don’t like purple, there are a whole WHACK of blues that you’ll want to avoid, blues that you might not have known lean to the purple side if I hadn’t warned you – same thing for green. And how you do figure out what type of blue you like? The above photo shows 3 of the more popular blue choices. LEFT: Blue-Purple. This has colours such as Windy Blue, Bracing Blue and Indigo Batik on it. CENTER: Blue (wink of green). Definitely a popular strip, including the colours Languid Blue, Tempe Star and Whirlpool. As this strip gets darker, the green comes up more. RIGHT: Blue-Green. The TOP blue strip these days, including hits like Tradewind, Rain and Moody Blue. And of course, for each one of those colour strips, there are MORE comparables that take things more purple/blue/green – it just depends on which direction you’re heading in! If you are wanting to paint your north facing room a beautiful blue, you need to tread carefully. Northern exposure is a cool gray/blue light. Adding blue to the walls will only compound the ‘cool look’ of the room and northern light also enhances cool colours slightly. 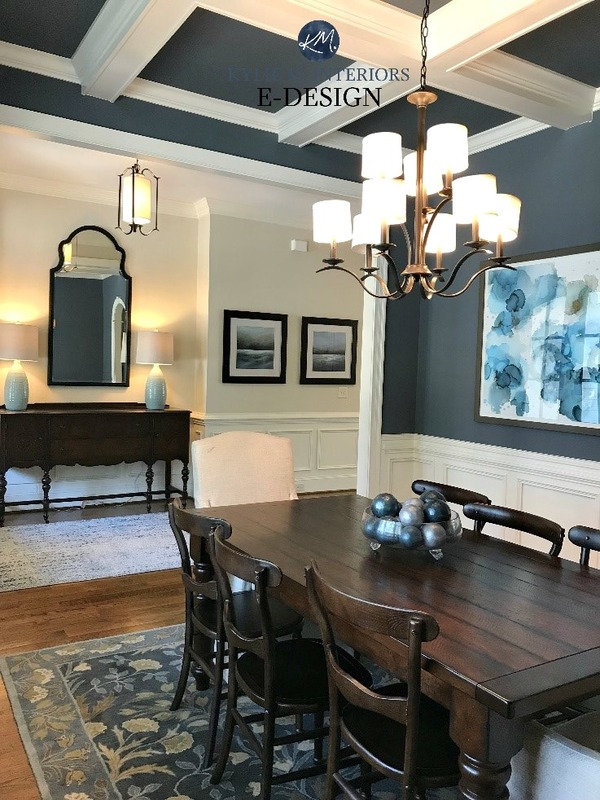 If you’ve fallen in love with a more cool-toned blue, you’ll need to do some serious interior work with lighting, accents and texture to add some balance to the space. However, if you are seeing what I’m explaining and are worried about that cool edge, consider a blue leans into green/gray, so that it’s a bit softer looking. Unlike a north facing room, a southern room just loooooves blue. Why? South facing light is warm/yellow and painting a southern room a warm colour only packs on the heat! By painting the walls a cool blue tone, you’ll help to balance out the warm sun rays and add some serious colour balance to the space. 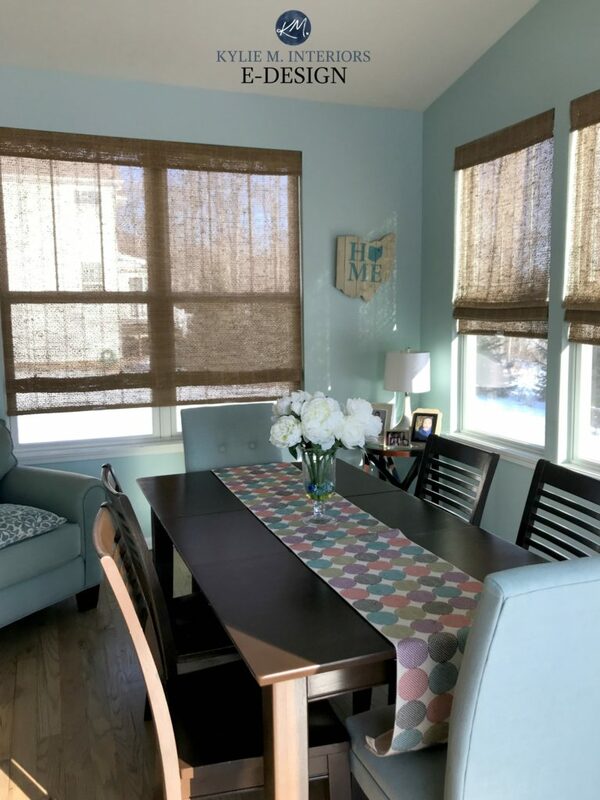 However, it’s important that you really LOVE blue, as in the evening, you won’t have that warm sunshine to balance things and will have to rely on your interior lighting to add the balance. Warm temperature light bulbs: When there isn’t any daylight, you might find that warm bulbs (particularly old-school bulbs) can cast a yellow/gold glow on the walls. When this mixes with blue, it can create a kind of blue/green blend. Daylight light bulbs: While personally, I find daylight bulbs a bit too crisp for everyday living, they can be nice in a bathroom. Daylight bulbs will really show your blue at its most true, but keep in mind that it isn’t a warm, friendly looking light. I’ve found that men often prefer daylight bulbs, whereas women often like the softness of a warmer light. Cold temperature light bulbs: There is not a single room that I would recommend these for – nadda. What are the best trim colours for blue paint? There are 3 ways to paint your trim when you’re using blue. Warm white: A warm white will slightly contrast with the blue, creating a really pretty combo as long as you don’t go TOO warm on the white, subtle and simple is best! So, now that we’ve covered the basics of blue, it’s time to pick you FAVE, so head on over to this blog post to see some of my faves! Not sure which blue is right for you? 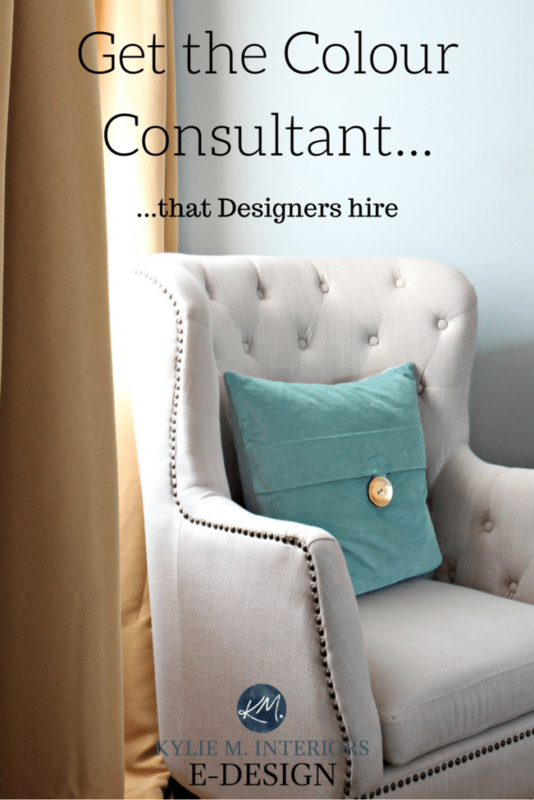 Check out my affordable and FUN E-Design packages! 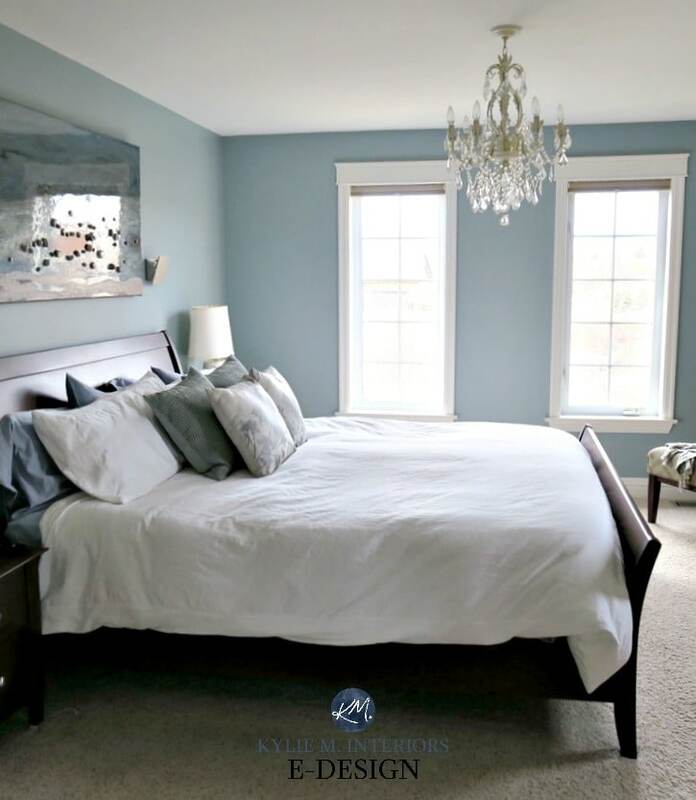 SW Moody Blue looks great in north Facing bedrooms! Oooo ya, it’s a beauty, isn’t it! 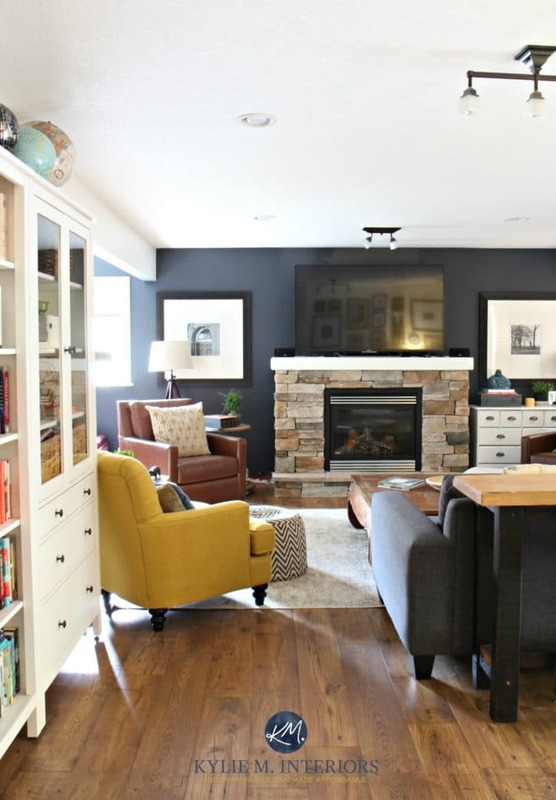 I love the look of Benjamin Moore Stonybrook! Would it tend to go more green or blue with northwest light? Hi there ! Great timing on this e-newsletter as I’m literally at the point of choosing a lovely blue to carry throughout my home. Can you tell me what paint colour was shown in the picture just under the three whites please ? It’s absolutely gorgeous. I’m assuming that the paint colour in the hallway would be something like a BM Navajo White or the sort, right ? It appears to be a bit more on the creamy side than the painted trim. I’m utterly in love with that picture ! Thanks for your input. Hi Christianne, that was SW Wall Street, super gorgeous, eh?! And that hallway is SW Wool Skein which I just did a colour review on last week! Hello! Could you please tell me the color of the walls in the bedroom pic with the white comforter?? Its gorgeous!! Hi, Can you tell me the difference between BM Tranquility and SW comfort grey? 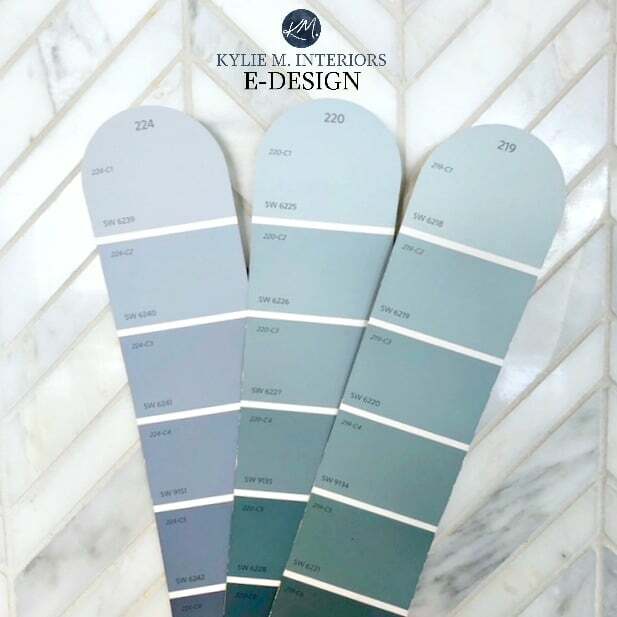 Thinking of painting our master bedroom one of these colors. Thank you! Hi Wendy, they are SO similar, Comfort Gray leans just a wink more green, but really it would be hard to really clarify the exact difference. Normal BM or SW colours are usually made up of 3-4 colours, whereas BM’s AFfinity line can have 7-8, meaning they are far more complex and prone to change throughout the day – and Tranquility is one of those! 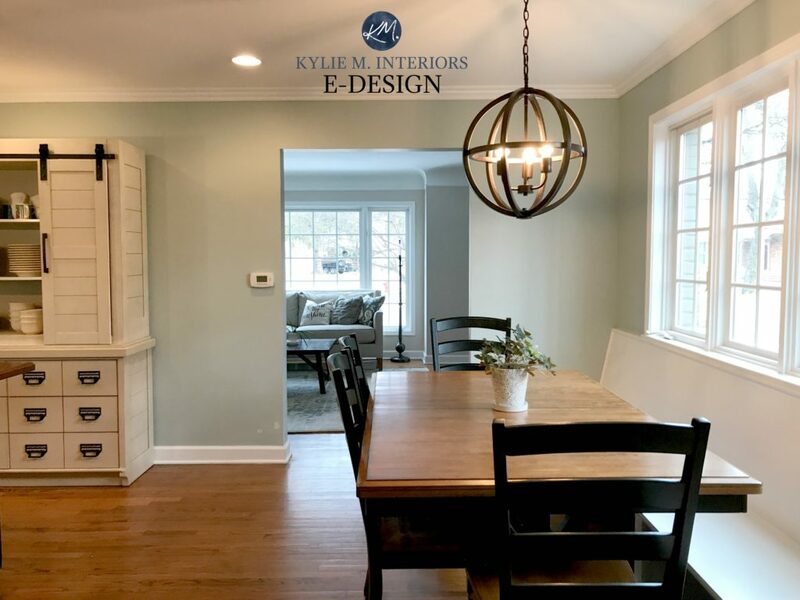 Hi Kylie, Love your website!! You are so talented!! I am looking for a soft blue (LRV 60s) paint color with no green undertones for a west facing master bedroom. Our furniture is medium brown sleigh bed style and our linens are white. Do you think BM Beacon Gray would work? Any other thoughts? Many thanks! I am in Australia and embarking on colour for a new home. I have a few hurdlles to conquer (slate floors). Are you able to advise on an e design course or are yhe ptoducts too different here?